We love July weddings. The weather is lovely – the perfect mix of heat and breeze – and is the perfect opportunity to host an outdoor wedding, not to mention take inspiration from nature itself. For us, July weddings mean fresh white marquees. They look beautiful in the grounds of a stately home, on a family farm or even in a back garden. Not to mention that they are the perfect blank canvas for every couple’s style. Pastel colours are another favourite for July. The soft shades translate perfectly to all aspects of a wedding day – from the dress to the cake to the flowers. Speaking of flowers, we love the big blooms and floral crowns that appear this month. Nothing says summertime like festoons of flowers! July is also the perfect time for delicate lace to make an appearance on wedding dresses. It’s the perfect detail – light enough to cope with the summer warmth but still holding on to the freshness of Spring. We love it! We also love food trucks! Who doesn’t? The perfect addition to any summertime bash. There are so many variations available now – from pizza trucks to paella fellas to wrap chaps. You can also get complimenting drink trucks. I’m sure by now we have all heard of the Prosecco van and pop-up gin bar trend! 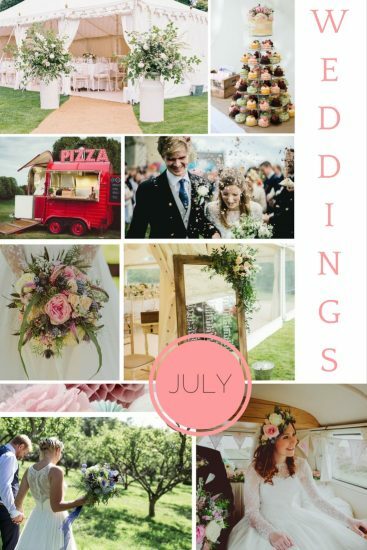 What is your favourite thing about July weddings?